Coaxial cable (or "coax") is the most common cable used for transmitting video signals. The name "coaxial" refers to the common axis of the two conductors. 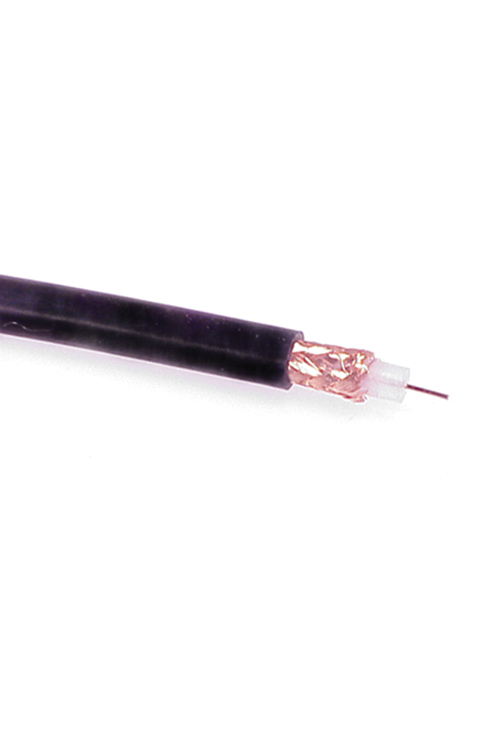 A coaxial cable has a solid copper or copper-clad-steel centre conductor surrounded by a non-conductive dielectric insulating material. The dielectric is surrounded by foil shield/s and/or copper braid/s which form the outer conductor and also shield against electromagnetic interference (EMI). The outer conductor/shield is encased in a PVC jacket. Most coaxial cables for video applications have a nominal impedance of 75 ohms. Their differing electrical and physical characteristics make it important to select the correct type of cable to suit the application. If the letters A, B or C appear before the slash (/) it indicates a specification-modification or revision. As an example, RG 8/U is superseded by RG 8A/U. The three most commonly used coaxial cable types for video applications are RG59/U, RG6/U and RG11/U. RG59/U is available with either solid copper or copper-clad-steel centre conductor. It's suitable for basic analog TV antenna feeds in residential applications and for basic CCTV systems over short cable runs. 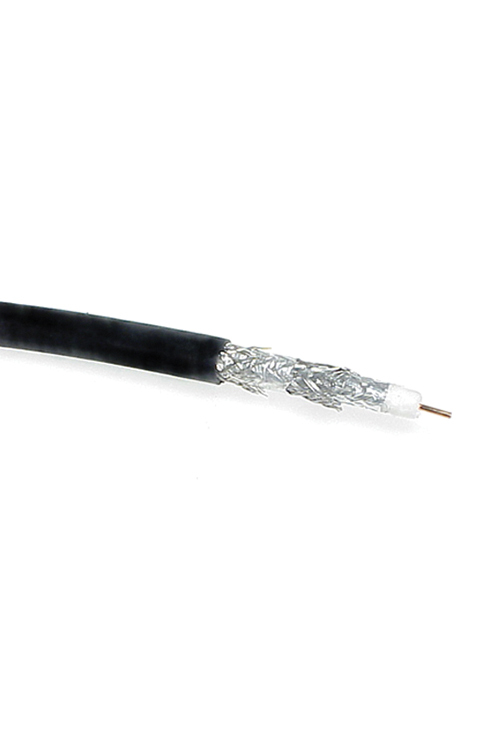 The copper-clad-steel type has high tensile strength and should be used when terminating the cable with F-Type connectors. RG6/U Quad-shield is the minimum requirement under the latest Australian Standard for digital TV antenna cabling and for all TV antenna cabling for apartments/units (MATV). It is also used for the distribution of Cable TV (CATV) and Satellite TV (SATV) in residential or commercial premises. It features a copper-clad-steel inner conductor. Single-shield, dual-shield and tri-shield versions of RG6/U are available but do not provide adequate EMI shielding. RG11/U Quad-shield is used for the same applications as RG6/U for either backbone cabling or for long distribution runs. It features a copper-clad-steel inner conductor. Use the table below to determine which cable should be used for your application. For cable runs greater than 545 metres. Recommended for long cable runs and for backbone cabling. BNC connectors are bayonet type connectors, commonly used in CCTV systems. They are the most suitable connector for use with RG59/U cable. BNC connectors are specified by IEC standard IEC60169-8. The argument, over what the "BNC" in "BNC connector" means, will go on forever. It has been variously defined as: British Navy Connector, Bayonet Node Connector, Bayonet Nut Coupling, Baby Neil Connector, etc. The two Amphenol engineers who invented the BNC connector were named Paul Neil and Carl Concelman. It therefore seems logical that the "true" meaning of the "BNC" acronym is perhaps "Bayonet Neil-Concelman". 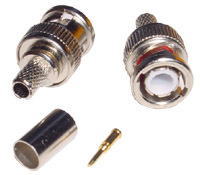 F-Type connectors are used for CATV, SATV and Digital TV in conjunction with either RG6 or RG11 cables. The copper-clad-steel inner conductor of the cable forms the inner "pin" of the connector. Although "twist-on" type connectors are available, they do not produce a reliable connection in comparison to a crimp-type connector that has been terminated with a good-quality ratchet crimping tool. F-type connectors are also known as F-81 connectors and are specified by IEC standard IEC60169-24. F-type connectors are named according to the type of cable or the application that they have been designed for as shown in the table below. 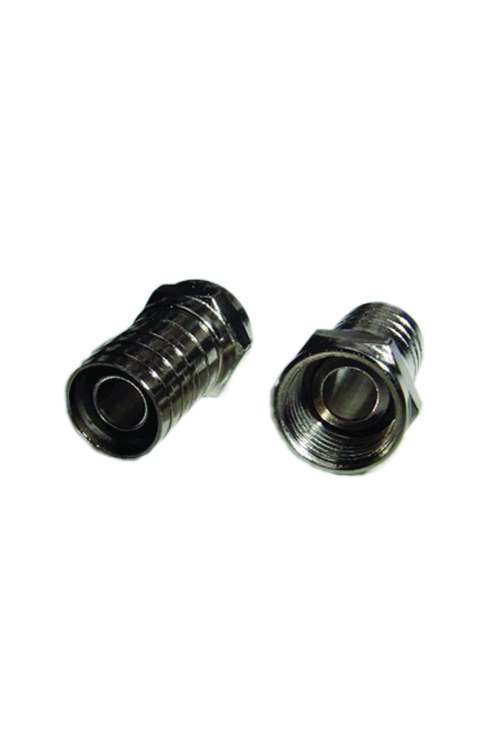 F-59 A male F-connector that seizes the outer braid and jacket of an RG-59, RG-6 (RG-56) or RG-11 coaxial cable. The cable's centre conductor extends through the connector to form the centre contact. F-61 An equipment or panel-mounted F-connector (usually female) with soldered cable connections. A 3/8" ( 32 pitch) thread is provided to accept the connector nut of the male connector. F-81 A female/female F-connector used to couple two male-ended cables together for in-line or wall-plate applications. Adaptors. 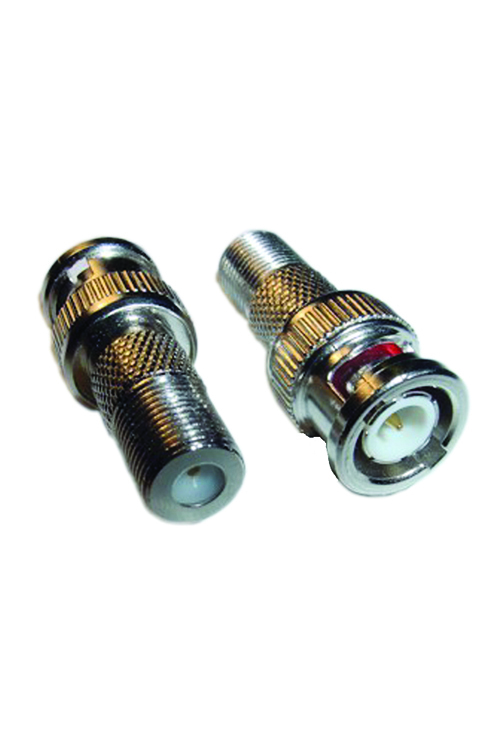 Where BNC connectors are required with RG6/U coaxial cable, it is recommended that an F-Type plug be crimped to the RG6/U and an F-Type to BNC adaptor used. Digital Broadcasting Australia has published an excellent coaxial cable installation guide.